Photos by Joanna Wilkinson, Toland Photography. Members of Staffordshire’s biggest business networking organisation are celebrating a record-breaking year during which almost £7.5 million of revenue has been generated for the local economy. BNI Staffordshire has expanded year on year since it was taken on by Newcastle-under-Lyme entrepreneurs Tony and Stephenie Altham in 2015, growing revenue for its members by £3m and adding around 80 new members. 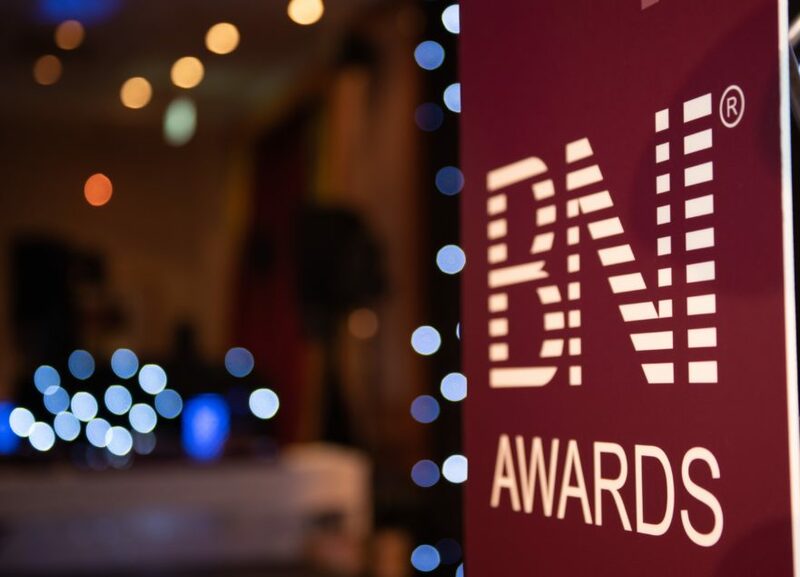 Success was celebrated at the BNI Staffordshire Awards, a dinner and Ball at the Moat House Hotel, Festival Park, attended by around 200 guests. Attendees were told that members had passed £7,454,441 of invoiced business in 2018. BNI members meet weekly and are taught to work collaboratively to generate new business opportunities for each other. The statistics for 2018, reveal there were 8,693 business referrals generated, with an average value of £857. The two biggest BNI Chapters, Britannia and BNI at 10, both meet in Stoke-on-Trent and generate almost £1.7m each in business. Two other chapters broke the £1m barrier in 2018; Sir Stanley Matthews, at the Upper House, Barlaston, and Izaak Walton, which meets at The Moat House, Acton Trussell, near Stafford. 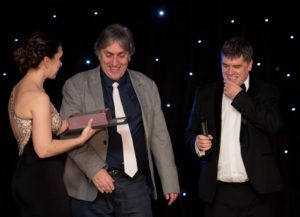 Awards in categories from Best Newcomer to Chapter of the Year were hotly contested at the 2019 event. Matthew Dashper-Hughes, owner of Office Prime Supplies took the prestigious Member of the Year Award. 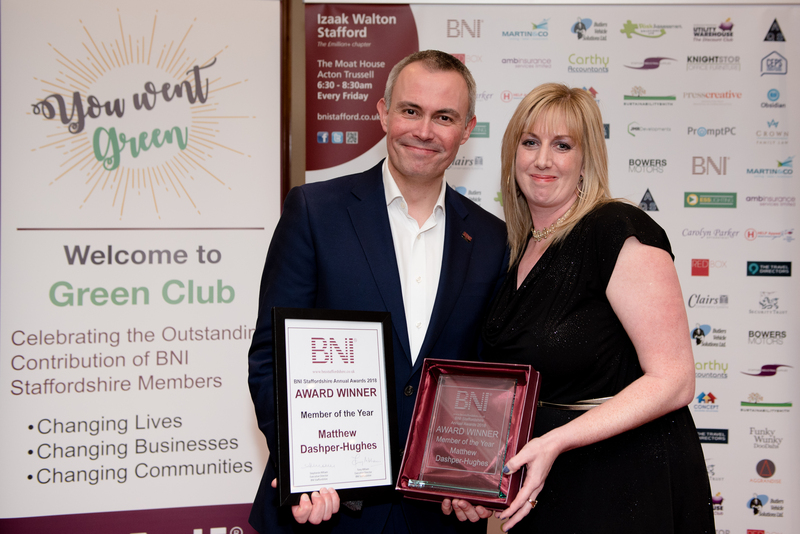 Matthew, a member of BNI at 10, said that around 85% of company turnover came from BNI referrals, adding that he recouped is membership fee within 10 weeks of joining. Further winners included: Best Newcomer, John Capper; Most Visitors, Darren Fortune; Highest Average Referral Value, Nigel Ryan; Most New Members generated, Stephenie Altham and Dave Meigh; Most High Value Referrals, Ian Walker, Most Thank You for the Business; Ian Walker; Training and Development, joint winners Matthew Dashper-Hughes and Stephenie Altham; Most Improved Member, jointly awarded to Emily Handy and Alex Jackson; Unsung Hero, Graham Tomlinson; Commitment to Growth and Change, David Meigh; Emerald Award, Stephenie Altham; Special Recognition Award, Andrew Plumley; Chapter of the Year, BNI at 10.